Lehman College broke ground Sept. 20 on a new $6.3 million Child Care Center that will double the capacity of its present center and serve 140 children for all-day and after-school programs. 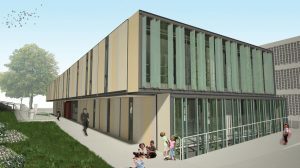 Because of its modular construction, the two-story center is expected to be ready for occupancy in Spring 2012. Designed to serve the children of Lehman students and support their progress toward graduation, the Center will contain six classrooms and a multipurpose room that can function as a playroom, after-school space, or additional classroom. Outside, a natural playground will incorporate greenery, boulders, and garden space, along with traditional playground equipment. Speaking at the ceremony were New York State Senator Gustavo Rivera; CUNY Executive Vice Chancellor and Chief Operating Officer Allan H. Dobrin; CUNY Vice Chancellor for Facilities Planning, Construction, and Management Iris Weinshall; Lehman President Ricardo R. Fernández; Lehman Vice President for Student Affairs Jose Magdaleno; and Erica Sevall, a Lehman student whose son, now in first grade, was enrolled in the center for several years. New York City Councilwoman Annabel Palma was represented in the audience by her legislative aide, Jeffry Laufer. Highlighting the program was a performance of the children’s song “The Carpenter’s Hammer” by four-year-olds from the Child Care Center. “For almost three decades, the Lehman Child Care Center has provided students with the opportunity for much-needed study time and the flexibility to engage in a more comprehensive college experience, which increases their chances of completing their degree programs,“ said President Fernández. “This new center will enable more of our students to concentrate on their studies, knowing that their children are well cared-for.” In 1991, the Center became the first in CUNY, and among the first forty in New York State, to be accredited by the National Association for the Education of Young Children. 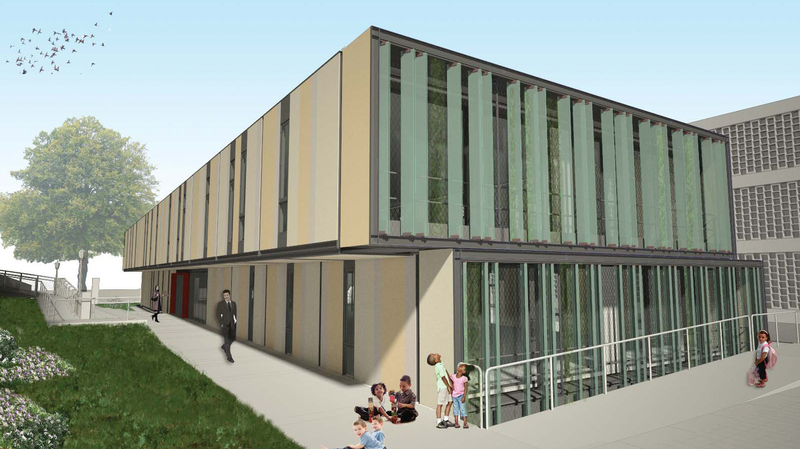 In addition to incorporating recycled building materials, the new structure will feature sustainable design elements, including a lobby atrium with a natural ventilation system and vertical gardens, visible through large glass sliding doors that will maximize daylight in classrooms. It will be located on the western side of the campus, along Goulden Avenue, between the College’s administration building (Shuster Hall) and one of its classroom/laboratory buildings (Davis Hall), in an area that is not currently being used. The project also will create a wheelchair-accessible path of travel from Goulden Avenue to Davis Hall and the rest of the campus. Designed by Garrison Architects, the building will be comprised of 22 prefabricated modules that will be delivered to the campus and assembled on-site in January 2012. The 12,000 sq. ft. building will replace the T-3 Building, which houses the current Child Care Center and will be demolished to make way for Phase II of the College’s new science complex. Lehman was one of the first CUNY colleges to open a child care center. In 1971, As the Twig is Bent Day Care Center was established off campus, with support from the Lehman administration and funding from New York City. The College’s current Child Care Center was created on campus in January 1985 and is operated by Imagine Early Learning Centers, LLC. The new project is supported by funds from the New York State legislature and the Office of the Bronx Borough President. Axis Construction is the project’s general contractor.